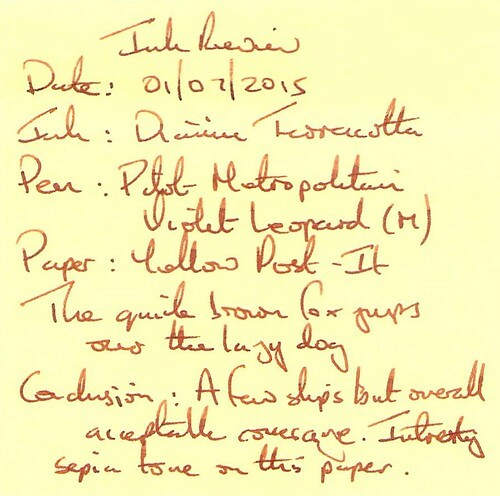 Terracotta is a form of earthenware and the name is Italian for “baked earth”. 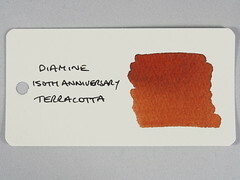 According to Wikipedia, Terracotta is “brownish orange” making this a good fit for the colour of the ink. 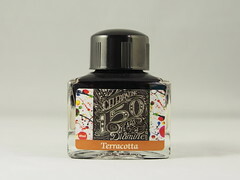 The ink cost £7.75 (including VAT), for a 40ml bottle, from a UK supplier, which along with the other inks in this series I would class as moderately priced. 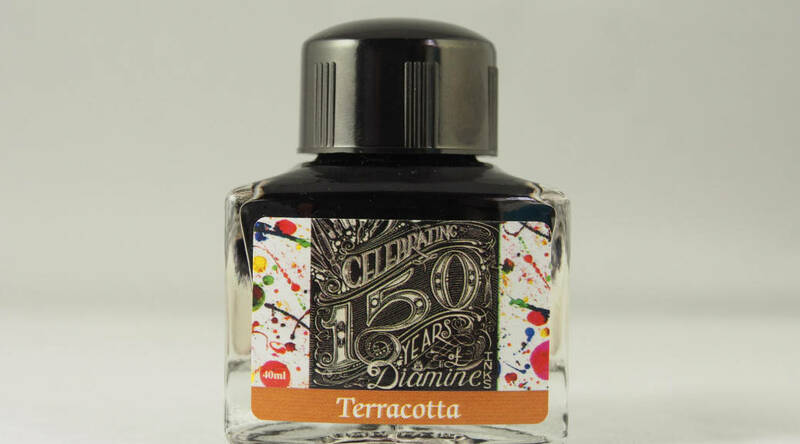 I gave descriptions of the box and bottle of the 150th Anniversary series in my review of Diamine Anniversary 1864 Blue Black Ink, so I won’t repeat them here. 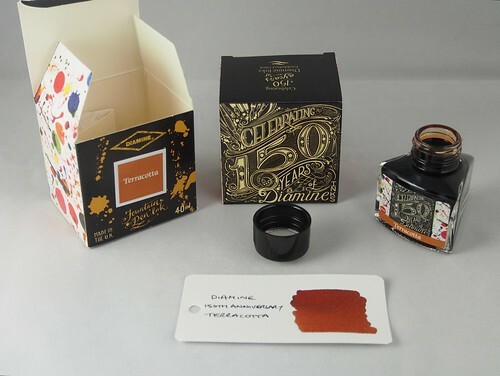 The only difference is that the backgrounds of the box and bottle labels are a close approximation of the Terracotta ink colour. The test pen in this case was the Pilot Metropolitan Violet Leopard (maybe the worst colour match possible) with a medium nib. 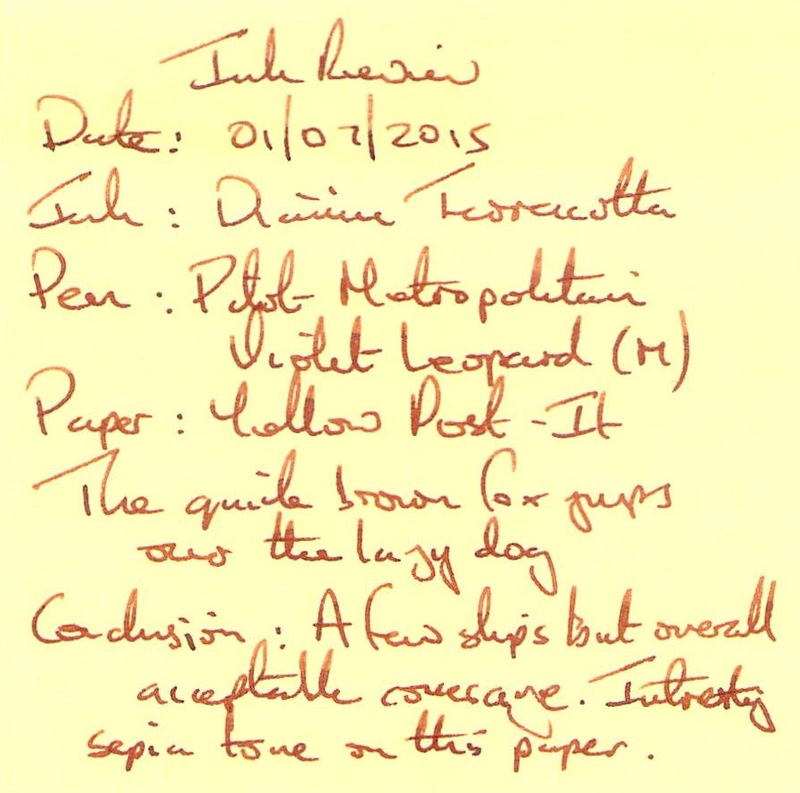 This ink showed minimal water resistance and water drops obliterated text easily. 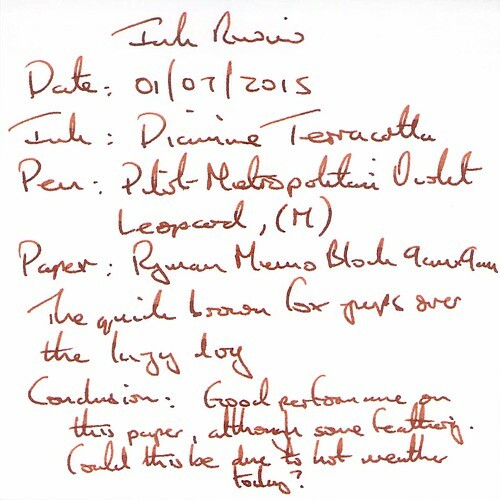 Cleaning the test pen was easy. Drying time was around 25 seconds. 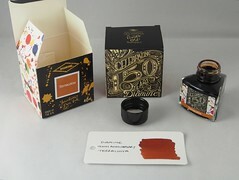 This is an attractive ink which shades to dark brown where the ink collects. 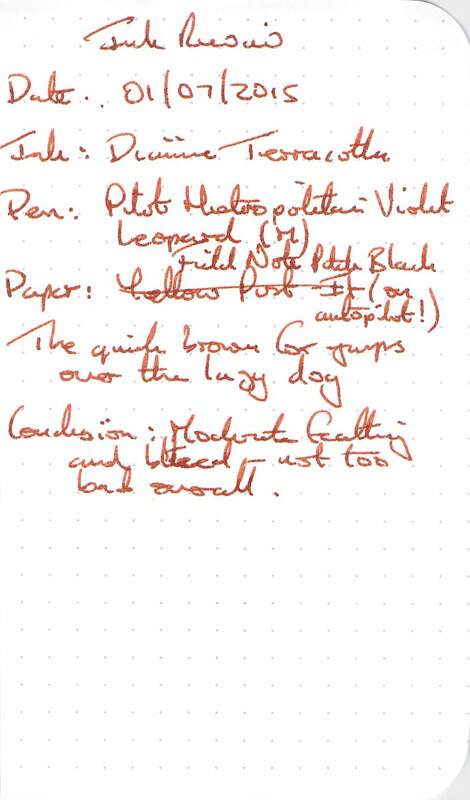 A small amount of smudging is present where the ink did collect. Some feathering, but good performance overall. 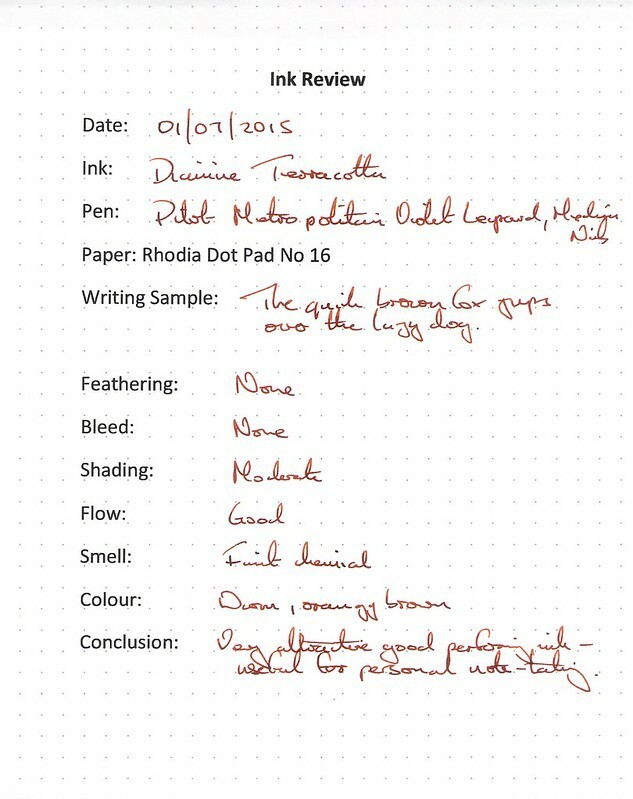 The ink takes on an interesting sepia tone on this paper, maybe due to the slightly thinner coverage than on the others. Not too bad but moderate feathering and bleed. 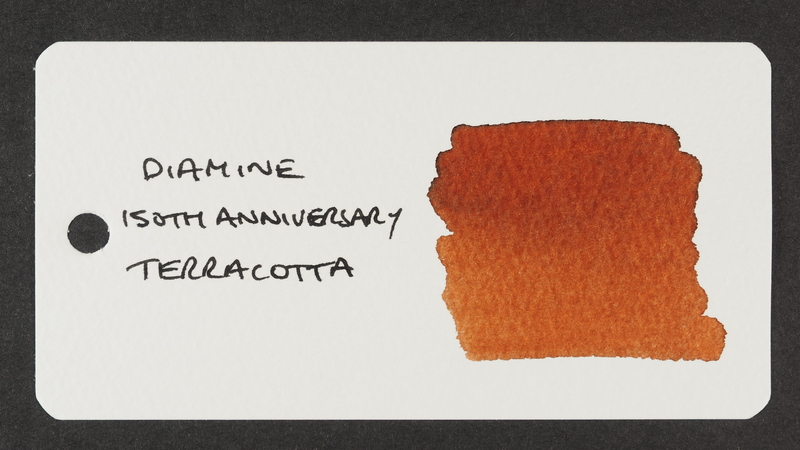 A fairly accurate representation but doesn’t show the darker shading possible, around the top extreme edge. I’ve mentioned before that I’m not really into brown inks, but this one sits in the sweet spot of reddish or orangish brown inks which I do like. 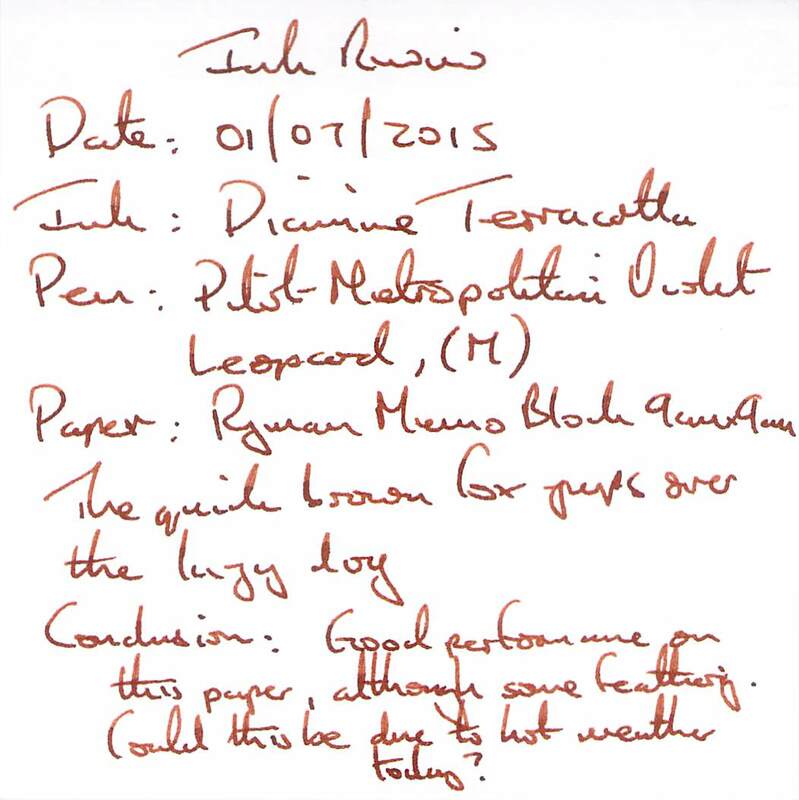 As such, I would find it useful for informal note taking.